On October 29, 2012, Superstorm Sandy hit the Eastern Seaboard, impacting more than a dozen states. New Jersey, which took the brunt of the storm along its densely populated coastline, was devastated. Lessons learned from prior natural disasters showed that victims of disasters like Superstorm Sandy are often at an elevated risk for acute behavioral health issues. While disaster-related issues subside over time, evidence shows that victims – especially those with pre-existing mental health issues – can experience a prolonged period of elevated risk. Older adults and disabled residents with mental health conditions are at increased risk. HQSI created data profiles for each of these counties and a subset of 10 communities impacted by the storm. The county profile introduction explains HQSI’s methodology, measurement time frames, and data considerations. The final version of the profiles was released in July 2014. The profiles are based on Medicare Fee-For-Services claims data and provide a glimpse into the prevalence and incidence of selected behavioral health conditions and risk factors for depression, as well as the utilization of Medicare-covered behavioral health services among Medicare beneficiaries residing in the selected counties or communities before and after Superstorm Sandy. Each county profile compares one county’s statistics to the aggregate of the 10 counties and to the other nine counties. Each community profile compares one community’s statistics to the aggregate of its county. The profiles will be updated in spring 2014 to include more comprehensive post-Sandy data, and an analytic treatment of the predictive value of the initial profiles in planning for and coordinating post-disaster. These At-a-Glance documents offer a quick reference to the data profiles developed as part of the Enhancing Coordination of Behavioral Health Services after Superstorm Sandy: Planning for Future Disasters project. Each document highlights one of five important topics of the comprehensive profile that gives readers basic information about the topic and refers them to the specific pages where additional details can be found. These sections also provide data that can assist in planning enhancements in the continuum of care for beneficiaries with behavioral health conditions. Behavioral Health Conditions and Utilization of Health Services Among Medicare FFS Beneficiaries Before and After Superstorm Sandy in 10 FEMA Disaster Counties in New Jersey. On October 29, 2012, Superstorm Sandy hit the Eastern Seaboard, impacting more than a dozen states. New Jersey, which took the brunt of the storm along its densely populated coastline, was devastated. Lessons learned from prior natural disasters showed that victims of disasters like Superstorm Sandy are often at an elevated risk for acute or chronic behavioral health issues. Clickable image of the Cover Page of the Superstorm Sandy ProfileWhile disaster-related issues subside over time, evidence shows that victims – especially those with pre-existing chronic mental health issues – can experience a prolonged period of elevated risk. Older adults and disabled residents with chronic mental health conditions are at increased risk. 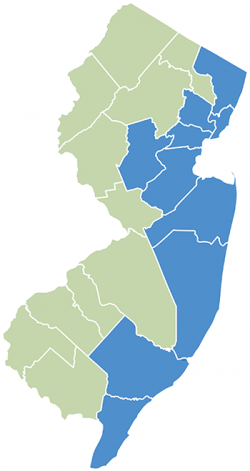 HQSI studied data from the Medicare claims database for Medicare Fee-for-Service (FFS) beneficiaries residing in the 10 NJ counties declared disasters by the Federal Emergency Management Agency (Atlantic, Bergen, Cape May, Essex, Hudson, Ocean, Middlesex, Monmouth, Somerset, and Union). Using this analysis, HQSI created data profiles for each of these counties and a subset of 10 communities impacted by the storm. The county profile Introduction which explains HQSI’s methodology, measurement time frames and data considerations. The 20 profiles explore potential county and community-level health status and health determinants of post-disaster spikes in behavioral health issues and treatments. Profiles updates, planned for 2014, will include more comprehensive post-Sandy data. Some older adults and disabled residents may be at increased risk of deteriorating health, depression, anxiety/adjustment disorders, and isolation as a result of Superstorm Sandy. New behavioral health profiles provide data that can help determine the storm’s impact. See details in the community-specific press releases below.